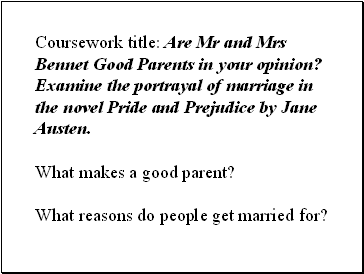 Coursework title: Are Mr and Mrs Bennet Good Parents in your opinion? Examine the portrayal of marriage in the novel Pride and Prejudice by Jane Austen. What reasons do people get married for? 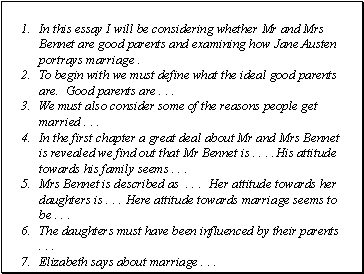 In this essay I will be considering whether Mr and Mrs Bennet are good parents and examining how Jane Austen portrays marriage . To begin with we must define what the ideal good parents are. Good parents are . . .
We must also consider some of the reasons people get married . . . In the first chapter a great deal about Mr and Mrs Bennet is revealed we find out that Mr Bennet is . . . .His attitude towards his family seems . . .
Mrs Bennet is described as . . . Her attitude towards her daughters is . . . Here attitude towards marriage seems to be . . . The daughters must have been influenced by their parents . . .
Elizabeth says about marriage . 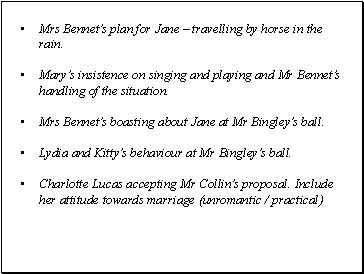 . .
Mrs Bennet’s plan for Jane – travelling by horse in the rain. Mary’s insistence on singing and playing and Mr Bennet’s handling of the situation. Mrs Bennet’s boasting about Jane at Mr Bingley’s ball. Lydia and Kitty’s behaviour at Mr Bingley’s ball. 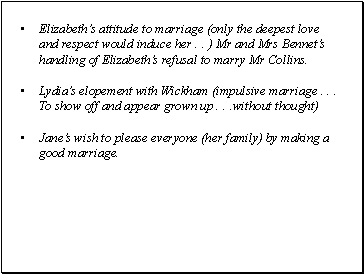 Elizabeth’s attitude to marriage (only the deepest love and respect would induce her . . ) Mr and Mrs Bennet’s handling of Elizabeth’s refusal to marry Mr Collins. Jane’s wish to please everyone (her family) by making a good marriage. 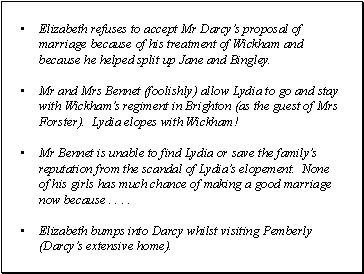 Elizabeth refuses to accept Mr Darcy’s proposal of marriage because of his treatment of Wickham and because he helped split up Jane and Bingley. Mr and Mrs Bennet (foolishly) allow Lydia to go and stay with Wickham’s regiment in Brighton (as the guest of Mrs Forster). Lydia elopes with Wickham! Mr Bennet is unable to find Lydia or save the family’s reputation from the scandal of Lydia’s elopement. None of his girls has much chance of making a good marriage now because . . . .
Elizabeth bumps into Darcy whilst visiting Pemberly (Darcy’s extensive home). 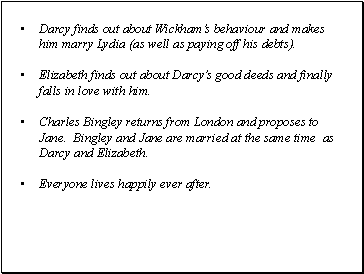 Darcy finds out about Wickham’s behaviour and makes him marry Lydia (as well as paying off his debts). Elizabeth finds out about Darcy’s good deeds and finally falls in love with him. Jane Austen (1775-1817) was a novelist.